Line drawing by C.S. Richardson from Jessop & Toelken (eds) Flora of South Australia 3: 1253, fig. 572A (1986). P. peruviana (as P. edulis) from Curtis's Botanical Magazine , t. 1068. 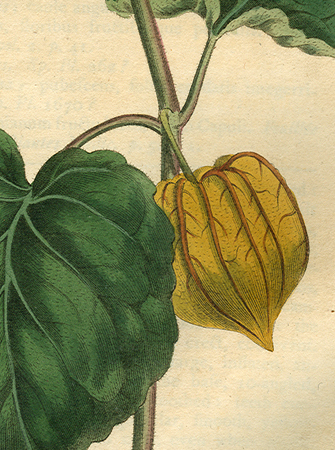 Detail of fruit of P. peruviana (as P. edulis) from Curtis's Botanical Magazine, t. 1068. Short-lived shrub to 1 m, densely pubescent with glandular or simple, non-glandular hairs. Leaves alternate, 2 per node (but not opposite); lamina ovate, cordate at base, up to 13 cm (usually c. 6 cm) long, entire or shallowly lobed; petiole to 5 cm long. Pedicels 6–12 mm long. Calyx 7–10 mm long; lobes triangular-acuminate, 4–5 mm long. 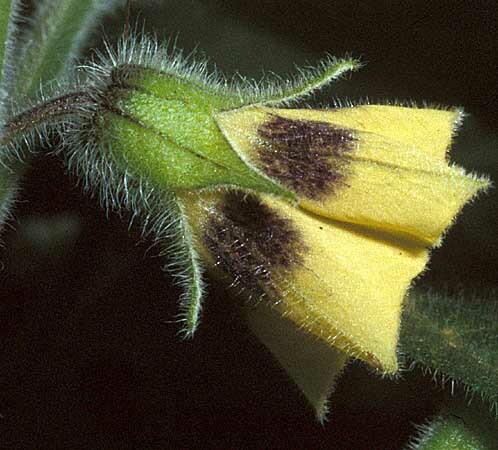 Corolla 5–angled, 10–15 mm long, dull yellow with distinct purple-brown spots alternating with the anthers. Anthers 4–5 mm long. Style 5–7 mm (occasionally to 11 mm) long. Fruiting calyx 10–angled, 27–40 mm long, the lobes free at apex for up to 10 mm, pale yellow-green to gold, drying to pale brown. 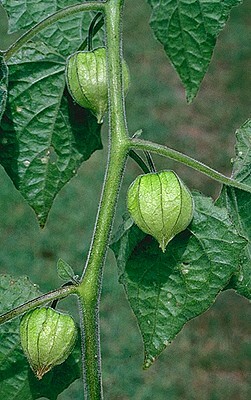 Berry globular, 10–20 mm diam., aromatic. Seeds disc-shaped, 1.7–2 mm long, pale yellow to orange-brown. Introduced to N.S.W. from the Cape of Good Hope at the end of 18th century. 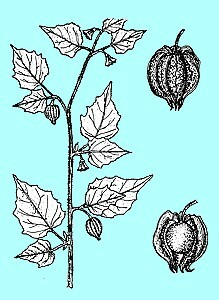 Robert Brown recorded Physalis pubescens in the Sydney region in 1802-4 (see Brown's list of introduced plants for the Sydney region reproduced in Journal of Botany 44: 234-5), but Brown's collection was re-determined by Symon (1981) as P. peruviana and has more recently been ascribed to P. angulata by Bean (2006). Now a garden escape or weed of disturbed areas, occurring in Qld, N.S.W., Vic., Tas., S.A. and W.A. ; commonest in south-eastern Australia; also on Lord Howe Is. peruviana - a reference to the place of collection of the type of the species. 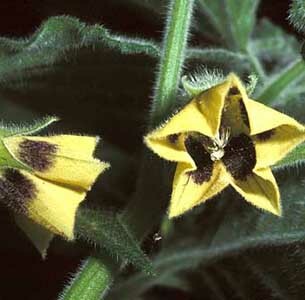 Information about P. peruviana as a weed in the Pacific can be seen at http://www.hear.org/pier/species/physalis_peruviana.htm together with mages. 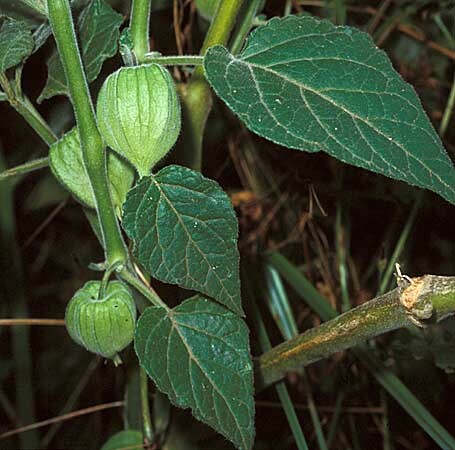 Note: with the confusion surrounding the application of names in Physalis, information given on the web which is species specific should be viewed with some caution.